Today we look into a website called GoEasyEarn.com. This website has been lingering around affiliate marketers hangouts for a short period of time without any real reviews or proofs on the potential income it proclaims to make users of its domain. GoEasyEarn.com states that it's an internet job site whereas you are hired to conveniently share a personal link. Ok.. let's move on shall we? 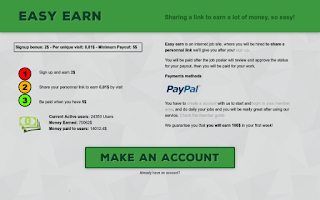 The instruction was to create an account and simply share your automated referral link for $0.01 per visit commissions with a payout once the account reaches $5.00 they also claim to give you $2.00 sign up bonus. In some form of truth goeasyearn.com does start you out with a $2.00 signup bonus and you actually do get additional credits of $0.01 per unique visit to their domain...but wait! Has ANYONE EVER been PAID from GoEasyEarn.com's Website? In actuality there, no stated facts anywhere on this subject just meer gazers no cash in hand vouchers! However the BBB (Better Business Bureau) does not list Go Easy Earn at all.. check here. I can imagine even if there were people or internet marketers who promoted this Go Easy Earn scam they would've had to notice at least 3 major red flags about this website among others I will list. #1. GoEasyEarn.com has "NO" actual products to sell. 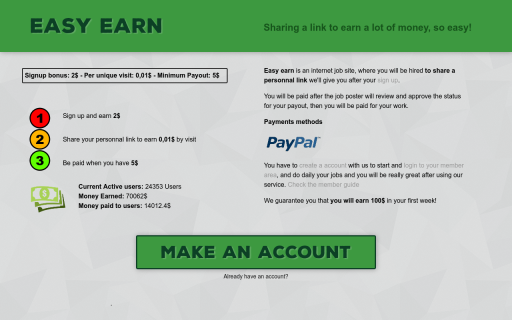 only an affiliate link that pays you to share it?? how does this even sound right? I mean sure there are such sites with at least pyramid schemes that pay you from recruiting other members into their organization but not here? So where does GoEasyEarn even get the money to pay its affiliates then? LMFAO!! #2. There is absolute "NO" Proof of commission payouts or comments by any members associated with GoEasyEarn.com whatsoever on the site anywhere. Really how can you vouch for a website that can't even give you at least ONE contactable member who states they have actually received a payment from GoEasyEarn. This furthermore proves the issue that it's a possible scam website! #3. GoEasyEarn is illegally using Google Adsense account because they sneak banner ads at the bottom of their pages! Ohhh! Now you get it, right? You are just helping them gain illegal Google Adsense impressions by showing it throughout various auto surf sites just to gain an extra $5.00 but when there account and URL gets banned then what?? Don't Be Foolish in Thinking You'll Earn Money with GoEasyEarn.com! There are really hundreds of other ways to make a decent profit online legally, without getting banned and scammed!